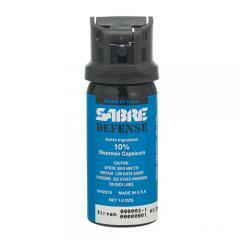 This Sabre Defense MK-3 from their H2O series contains an innovative formula with a distilled water base. Using water makes the formula non-flammable and safe to use alongside electronic discharge weapons for a combined arms approach to less-lethal deterrence. The nitrogen propellant prevents it from freezing in cold temperatures, and its reduced decontamination period makes cross-contamination less likely. The spray contains 10 percent oleoresin capsicum with 0.33 percent major capsaicinoids, and features a foam dispersal system that sticks to the target's face. Any attempts to wipe it off simply work the active ingredients into the skin for an even more painful burning sensation.